My mom always tells the story about how I taught myself to read when I was three years old. I remember her reading me books over and over till I knew them off by heart. She’d try and skip a few pages to get to hurry things along, but said I would always notice and demand she go back and read the skipped pages! My love for reading hasn’t waned and I’m still devouring books 30+ years later! I decided to make a list of some of my all-time favourite books from recent years as well as finding out what books my friends recommend. I’m always looking for new books and have added a few to my TBR (To Be Read) pile. My Facebook friends recommend these books. I’ve read a few of them and have added some to my list to read! You might also like Everything You Need to Know about Outlander or books like Gone Girl. What books do you recommend? Have you read any of the books on this list? Well too bad I missed the giveaway but still tons of great reading suggestions for my book club in the upcoming year. I have read some really incredible books lately. Some of them are: The Invisible Bridge by Julie Orringer, The Book Thief by Markus Zusak, The Kindness of Strangers by Katrina Kittle, Breaking the Silence by Diane Chamberlain, Me Before You by Jojo Moyes, Still Alice by Lisa Genova, The Reason I Jump: The Inner Voice of a Thirteen-Year-Old Boy with Autism by Naoki Higashida, The ChildCalledIt by Dave Pelzer, Minding Frankie by Maeve Binchy, Storyteller byJodi Picoult Same Kind of Different as Me by Ron Hall, and Twelve Years a Slave by Solomon Northup. Thank you for sharing some of your favorites. I love finding new titles. Great list, I really want to read a lot of them and have already a few like the Neil Gaiman book and Divergent. I’m a Stephen King fan and have been for years. Have read The Dark Tower series. When he started writing them it was supposed to be a trilogy but grew and grew and grew some more. Great read but kind of long. Great list I have most of the books on both list. I would suggest adding Water For Elephants- Sarah Gruen and The Discovery of Witches- Deborah Harkness. Both inviting reads the keep even the most lax reader interested. Happy Reading. 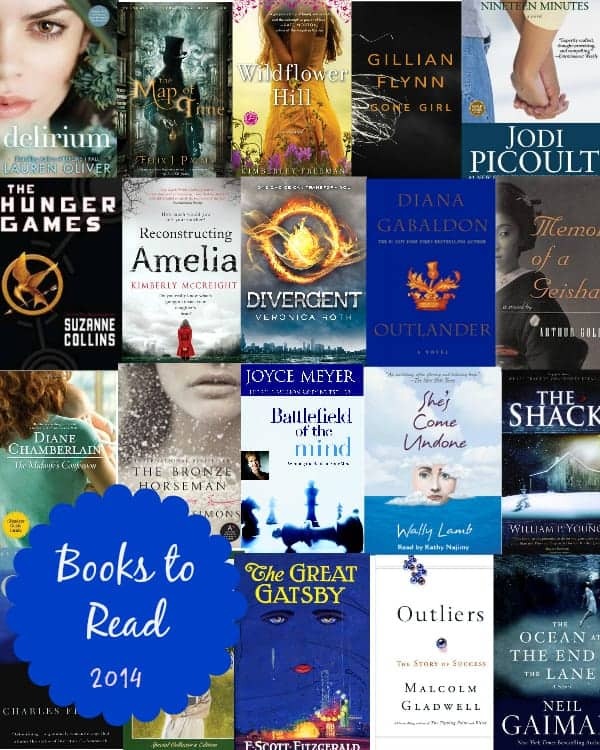 I LOVE that Anne of Green Gables is on one of the lists. Of all the books I’ve read — and I’m a voracious reader — Lucy Maud Montgomery is one of my favorite authors. I am so glad she lived a long life and had a chance to write so many lovely books! “Matched” by Ally Conide is a really good read. “The Book Thief” by Markus Zurak, it has a movie for it too. Love your site and your choice of books. I’m a fellow Canadian, from Toronto, and I’m the author of Rachel’s Secret and Rachel’s Promise (Second Story Press) and the third book of my trilogy will be published in September. Hope you get a chance to read my books at some point! From the original list I’ve read: The Hunger Games and Memoirs of a Geisha. From the fb list I’ve read: Pride and Prejudice, The Shack, Anne of Green Gables, and Outliers (an amazing book!!!). I haven’t read the Lord of the Rings, but I have read The Hobbit. Anne of Green Gables changed my life. L.M. Montgomery has been my favorite author since I was about 11 (I’m 16 now). Her books never fail to make me laugh and contemplate life, no matter how many times I’ve reread them. If you haven’t read anything by her, do it. I guarantee you’ll fall in love with a character. I have read many books before and after the Outlander series and it remains my absolute favorite. The most captivating book I’ve ever read. Be sure to read the Outlander series! It is awesome…reand them 3 times. Ready to begin book 8.. It’s finally out! Thrilled to have found this list! I love to read and am always looking for new books to dive into.